The European Academy of Sociology (EAS) invites nominations for its newly established Raymond Boudon Award for Early Career Achievement. 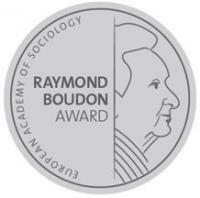 Named after one of the staunch supporters of the EAS, Raymond Boudon, the award has been established to promote rigorous standards in Sociology and to recognize scholars under age 40 or within ten years after defending their dissertation. Scholars can be nominated who have made a very significant contribution to European sociology through a body of publications. Nominees are early career scholars under age 40, or within ten years after defending their doctoral dissertation; they should not be fellows of the EAS. Nominees substantially contribute to European sociology either via their affiliation or through the European focus of their work. Nominations should be made by at least two peers. Self-nominations are welcome but have to be endorsed by at least two peers. The Selection Committee may invite nominations as well. Nominations should include a short (maximum one page) explanatory statement as well as a curriculum vitae of the nominee, including date of birth and date of the doctoral degree. The nominations are treated confidentially. The nominations are evaluated by a Selection Committee of the EAS. The Selection Committee submits a recommendation to the EAS Annual Meeting. The fellows present at the EAS Annual Meeting take the final decision. The Raymond Boudon Award is presented at the subsequent EAS Annual Meeting. The Raymond Boudon Award winner receives a medal and an invitation to deliver a lecture at the EAS Annual Meeting. Please send nominations to the EAS Secretary (v.buskens@uu.nl) before July 1, 2019.